The expenditure of £555 million of public money over 50 years to eradicate TB in cattle has given “poor value for money”, with one in eight herds still infected with the disease, the NI Audit Office has found. European Commission figures from last year show that 12.4% of herds were infected in NI, much higher than the Republic of Ireland at 4.9%, similar to Wales at 12.5%, and lower than the overall rate in England of 20.4%. Former Agriculture Minister Michelle McIlveen watches as DAERA vet John Kennedy records the animals that were tested for TB during a visit to a Co Down dairy farm. Scotland is the only part of the UK to be Bovine TB-free. The findings came from the Northern Ireland Audit Office Report (NIAO) report on Eradicating Bovine TB in Northern Ireland. NI farmers receive 100% compensation for infected cattle from the public purse, which provides little incentive for the industry to share ownership of the problem, he said; government, farmers and environmentalists must work together to eliminate the disease. 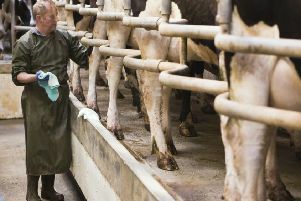 The auditor said all sources of infection must be tackled at the same time – infected cattle, infected badgers, purchased animals and inadequate clearance of the disease from herds or the environment. However, he did acknowledge that the disease would have had a much bigger impact on Northern Ireland’s farming industry if the Department of Agriculture and Environment and Rural Affairs (DAERA) had not been intervening. The auditor also noted that the disease is no longer a direct threat to people, due to testing and pasteurisation. UUP leader Robin Swann laid the blame for the continued prevalence of the disease “squarely” at the door of the department for its “lack of action”. The discovery of an infected cow often comes as “a body blow” to a family farm, he said. “For far too long now farmers have had to endure both ministers and senior departmental officials who paid lip service to the issue and never appeared to really grasp the devastating impact the disease,” he added. He noted that the European Commission’s Bovine TB sub-group found there is “considerable evidence” to support culling of badgers. DAERA welcomed NIAO’s acknowledgement that its bovine TB programme is “essential” to underpin NI’s annual £1.5bn agri-export market. A spokesman also noted that the auditor’s main recommendations “align” with those in its own most recent strategic consultation. “The department will take time to consider the report in detail,” he added. However, the Northern Ireland Badger Group said the currently used skin test only detects around 50% of infected cattle and the remaining 50% of infected animals are left undetected in herds and can then infect badgers. It recommends tackling the problem with better testing and vaccination.